For the first Music Friday of November, we’ve unearthed a cool song by The B-52s that happens to have this month’s birthstone — topaz — as its title and musical hook. Few people know that a Maine psychic gets the credit for inspiring the song’s “topaz” connection. “Topaz,” which was written by the group and appeared on its 1989 blockbuster album, Cosmic Thing, is a song about a fanciful city by the sea, where blue dolphins are singing, skyscrapers are winking and minds swim in ecstasy. Group member Kate Pierson revealed to Onion AV Club that the song’s “topaz” theme is credited to a Maine-based psychic she consulted while the group was finishing up its Cosmic Thing album. Pierson explained that the group had started writing the song that would eventually become “Topaz,” but they didn’t have a chorus. The B-52s were formed in Athens, Ga., in 1976 and scored their first big hit, “Rock Lobster” in 1978. Rooted in new wave, the group continues to perform with original band members Pierson, Fred Schneider, Cindy Wilson and Keith Strickland. A fifth original member, Ricky Wilson, succumbed to AIDS/HIV-related health complications in 1985 at the age of 32. The band’s name relates to the beehive hairdo Pierson and Cindy Wilson sported during the band’s early years. The shape of their beehives resembled the nose cone of a B-52 bomber. Written and performed by The B-52s. 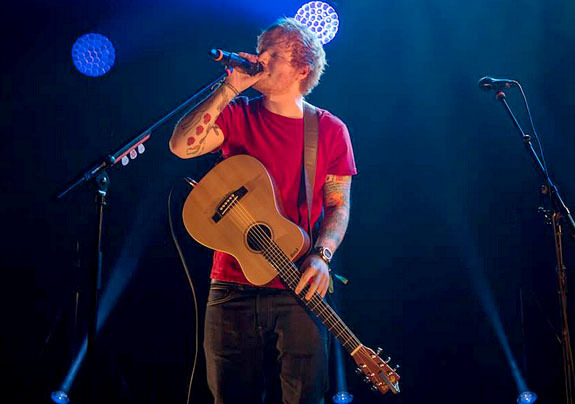 British pop star Ed Sheeran made superfan Katie Papworth’s dream come true last week when he accepted her infinity-symbol engagement ring and marriage proposal prior to his concert in Glasgow. What makes this story extra special is the fact that the 19-year-old Papworth has been battling a rare form of brain cancer for the past eight years and lost her eyesight to the aggressive disease only two weeks ago. 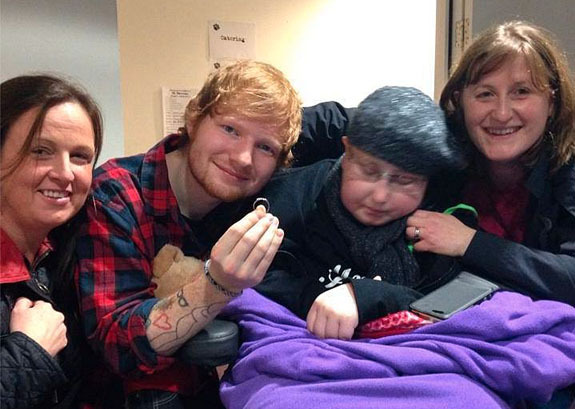 Papworth was thrilled to meet her idol backstage, where she presented Sheeran with a ring engraved with an infinity symbol. She also gave Sheeran a painting she drew before she lost her sight, and he reportedly raved about her work. 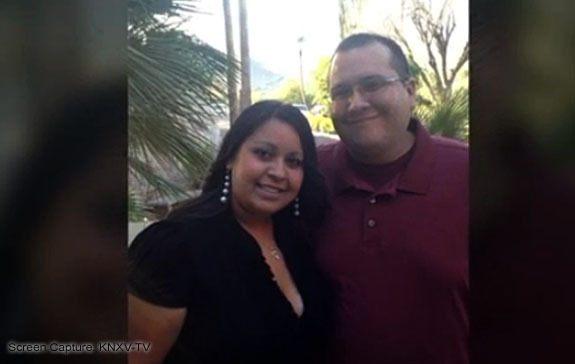 Brooklin Yazzie’s desperate plea to get her beloved wedding ring back after she accidentally gave it away with Halloween candy Friday night has been heard around the world. 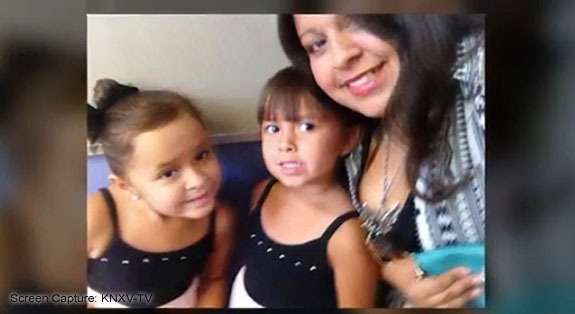 What started out as a local story covered by Phoenix ABC-TV affiliate KNXV, has been picked up by numerous other TV stations, news sites and bloggers worldwide. 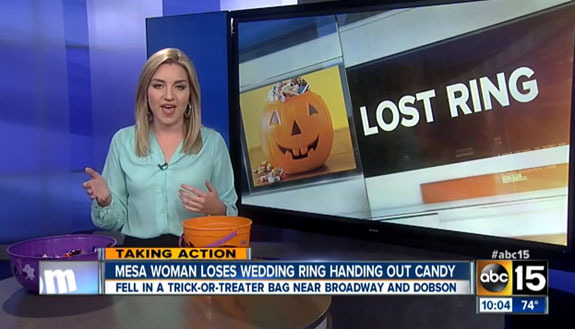 Yazzie, a resident of Mesa, Ariz., had taken off her gold wedding ring and placed it in a candy jar so it wouldn’t get slimy while she carved pumpkins with her young daughters. But as Friday evening wore on and the onslaught of trick-or-treaters became more intense, she unwittingly emptied the contents of the jar into a larger bag that she used to distribute candy and goodies to the neighborhood kids. 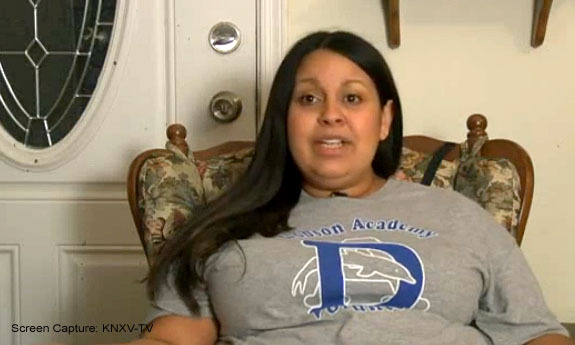 Yazzie normally would have been out trick-or-treating with her kids, but this year she was relegated to door-bell duty due to a foot injury and a baby on the way. The reason why Yazzie’s story has struck a cord with viewers and readers around the world is not because of the value of the ring. She said, frankly, that it would fetch maybe $50 at a pawn shop. Far more important is the ring’s sentimental value. To Yazzie, it’s priceless. It’s the ring her husband placed on her finger on their wedding day 10 years ago, when she was barely 20 years old. They were just starting out and had settled on a basic ring because they couldn’t afford a fancier ring at the time. Yazzie and her family have been busy posting fliers throughout their neighborhood, hoping that the little kid who has a very real piece of jewelry in his loot bag will do the right thing and return it to its rightful owner. And with the viral nature of her story, it’s unlikely the lucky kid with the gold ring will have any doubt that the ring belongs to Yazzie. 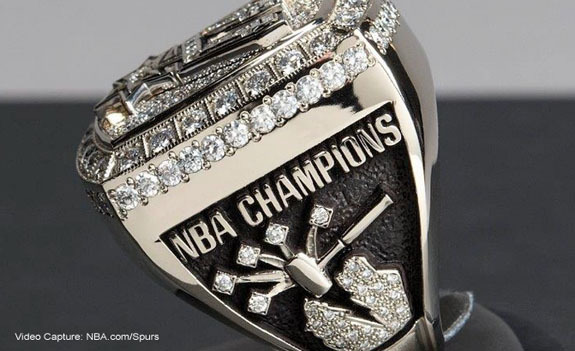 The San Antonio Spurs marked their fifth NBA title by raising a new banner and showing off their massive diamond-encrusted championship rings prior to their 2014-2015 season home opener against the Dallas Mavericks last Tuesday. Each 14-karat gold ring weighs more than three ounces and features diamonds with a total weight of 5.09 carats. 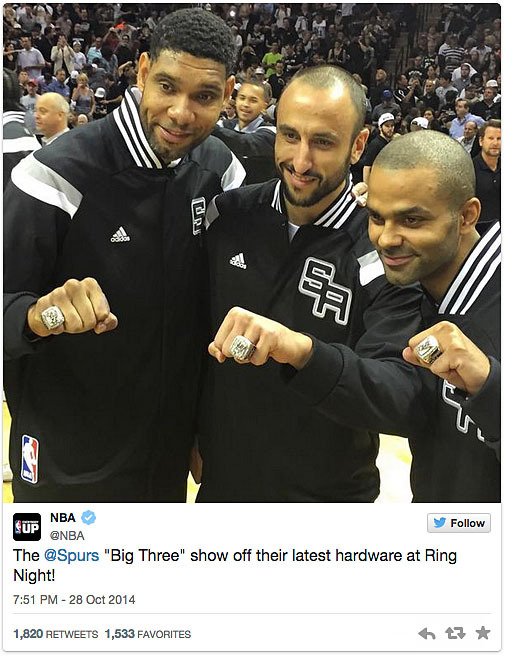 The Spurs’ big three — Tim Duncan, Manu Ginobili and Tony Parker — were excited to show off their rings during the pre-game ceremonies. Every fan attending the opener took home a blingy one-size-fits-all commemorative ring — designed in base metal and glittering with what we assume are cubic zirconia or crystals. Spurs fan Daniel Ortiz shared a photo on the Spurs’ Facebook page that demonstrates how the rings have gotten progressively larger with each championship. The team’s previous titles were in 1999, 2003, 2005 and 2007. 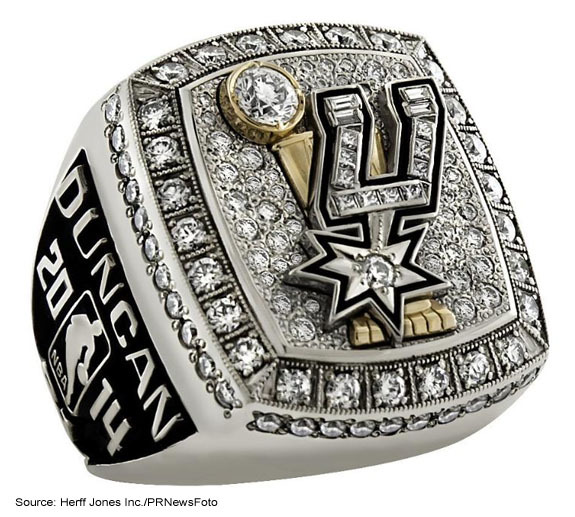 In a neat design twist by manufacturer Herff Jones, the right side of the ring has a custom feature that showcases the Spurs’ “Pounding the Rock” symbol with five sparks shooting out from the rock. 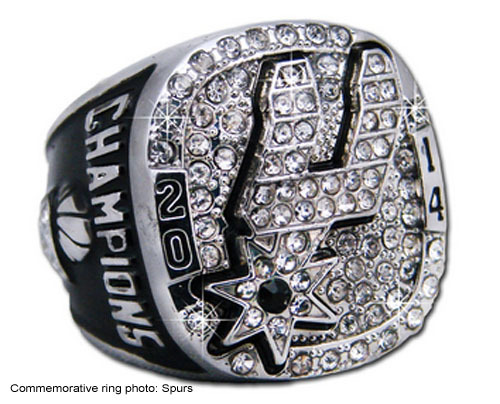 Each player's ring has from one to five extra diamonds coming off the sparks, depending how many times that player has been on a Spurs championship team. 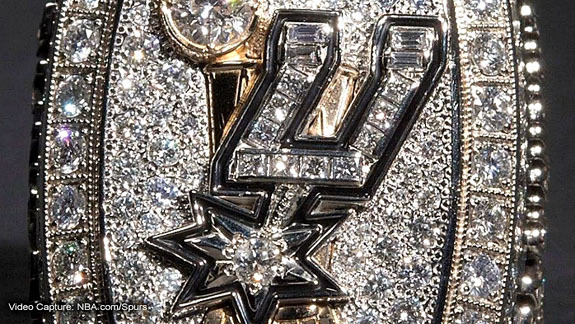 The face of the ring features a diamond-studded Spurs logo in 14-karat white gold superimposed over a 14-karat yellow gold representation of the Larry O'Brien NBA Championship Trophy. A large bezel-set diamond symbolizes the basketball of the trophy. The face of the ring includes 76 round, 10 princess cut and four baguette diamonds. 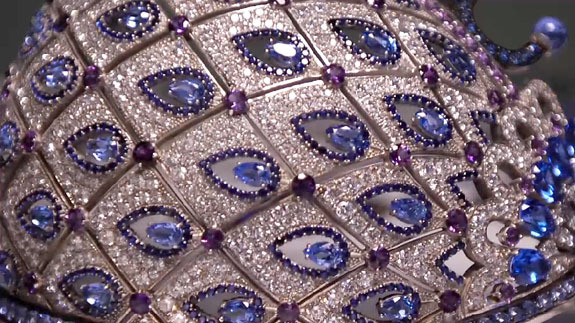 An additional 42 round diamonds frame the face. The left side of the ring showcases the player's name and number along with the NBA logo and winning year 2014. The raised lettering is in white gold against a black enamel background. 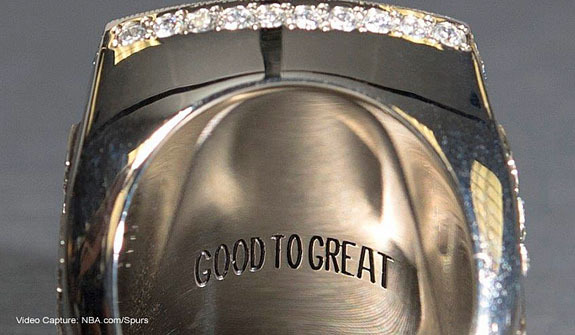 The inside of the band is inscribed with the team’s motto: “Good to Great.” The Spurs came within one game of winning the championship in 2013, but were knocked out by the Miami Heat in seven games. The motto reflects the team effort to come back from that disappointment to be better than before. In 2014, the Spurs got their revenge by defeating the Heat in five games.